Do you want a FREE light bulb that can micro-mine? Imagine if you can micro-mine for cryptocurrency by flipping on your lights. 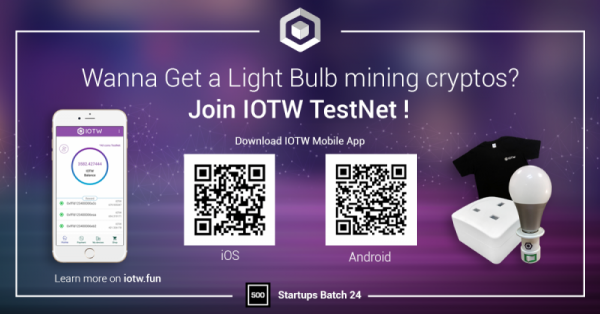 Join IOTW TestNet to win a free light bulb. It’s easy and 100% free! Since the TestNet’s launch, many tester-users have been purchasing IOTW t-shirts and stickers with TestNet coins while smart light bulbs and smart power plugs will be available soon. Bulbs and plugs can mine for more real IOTW coins. Don’t skip out on these opportunities to generate passive income at home.